This is a guest article by a gentleman who wishes to remain anonymous. Article Contains material for psychology + last 34 years question papers, NCERT, NIOS, Lectures. How did I prepare these psychology Notes? Dear friends, as you’re aware UPSC now requires only one optional subject in the mains, instead of two. 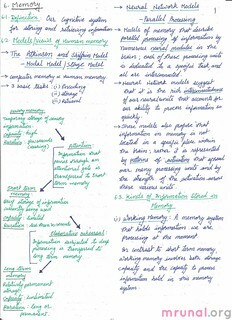 Therefore, I’ve switched from Psychology to Public Administration and handing over these notes to Mrunal so it could be useful to those of you who’re still in the psychology group. June 2012 – I decided to prepare for civil services. Quickly decided my optional (Psychology and Pub Ad.). June 2012 – First 15 days – Read NCERT psychology 11th and 12th line by line. It really helped in generating interest for the subject. Did not make any notes at this stage. Referred Shubra Saxena’s blog for initial guidance. Saw previous year questions – Was able to answer some of them simply by reading NCERT – felt good – Decided to go with psychology. June 2012 – Last 15 days – I saw videos of Yale University by Dr. Paul Bloom on Introduction to Psychology on udemy.com (https://www.udemy.com/introduction-to-psychology-with-paul-bloom/). There are other videos too but I personally liked Paul Blooms’s lecture. I made short notes along with the videos – Mindmaps, flowcharts etc. August 2012– Did not do much in psychology – Just revised my notes once. September 2012– I referred NCERT again – Highlighted relevant texts in the PDF. I enriched my notes from NCERT stuff – Adding topics that were not covered earlier in Baron, some extra topics, India specific examples, some flowcharts etc. October 2012– Opened Mukul Pathaks notes – did not find them useful – Did not read more than 15 – 20 random pages – Made no addition to my notes and never referred Mukul Pathak again. All the topics can be easily prepared from the standard books. Wrote few mock answers – just to revise and do some answer writing practice. November 2012 – Made notes from Smarak Swain – For paper 2. I think this one book is enough for paper 2. I could not complete it – As got caught up with other urgent issues that needed my attention. December 2012 – Rumor mills of pattern change. Stopped my psychology preparation and revised whatever I had prepared (notes) – I had plans to cover Atkinson and Hilgard in the month of Feb 2013 – Once the notification for CSE 2013 gets published. Atkinson is a good book for quoting relevant experiments and researches. Pattern changed – My tryst with psychology also came to an end. I’ve no regrets though. Knowledge gained is never wasted. NIOS – Material is basic – Can give a quick read. Robert Baron Psychology – do a detailed study – supplement it with internet. Atkinson & Hilgard – For recent research’s and experiments – quote in your answers. Smarak Swain, Applied Psychology: India Specific and Cross-cultural Perspectives by (New Vishal Publication): Mug it up. Cover recent news articles – quote wherever relevant. Mukul Pathak notes are not a ‘Must do’ – You can cover all the relevant topics from standard books. Use flowcharts and diagrams liberally. I’ve not converted scanned images into PDFs because it drastically increases the file size= takes way longer time to download (unless I reduce the image quality, but then it becomes difficult to read.) Anyways, there is no dearth of image to PDF software’s on net if you want. for IGNOU BA/ MA psychology material visit egyankosh.ac.in (their server giving headache, so not compiling at the moment). Sir please send your handwritten notes to my email. Sir, Not able to download your notes as well as ncert book pls guide. I have notes. If u want without any cost, you may contact on this no-7085506585. Not downloading.. please make it available. I have upsc psychology handwritten notes. If anyone need without any cost, may contact or email to me. My Contact no 7085506585. I want psychology MA & MPhil notes English medium.thanks. Respected sir,kindly send your hand-written notes to my gmail. It would be a blessing to me.